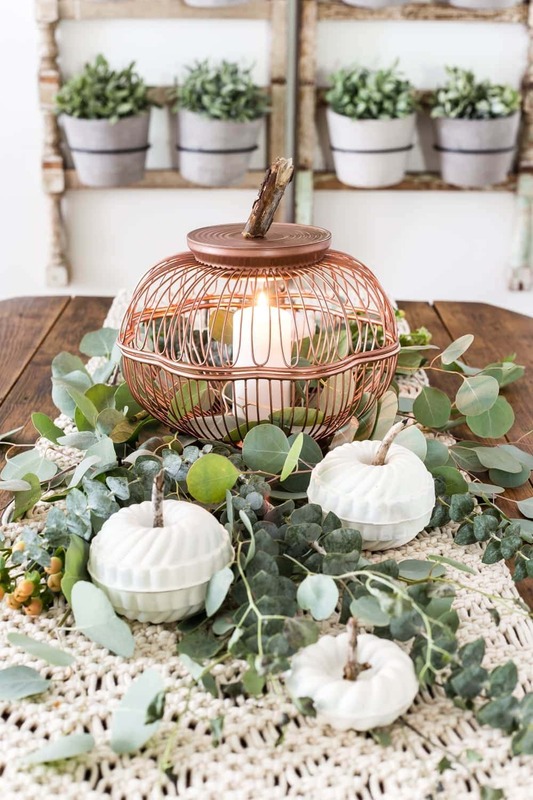 A step-by-step tutorial for making craft pumpkins for fall using thrifted vintage wire bread baskets and mini bundt pan Jello molds. Accidental “light bulb” moments might be my favorite part about thrifting. 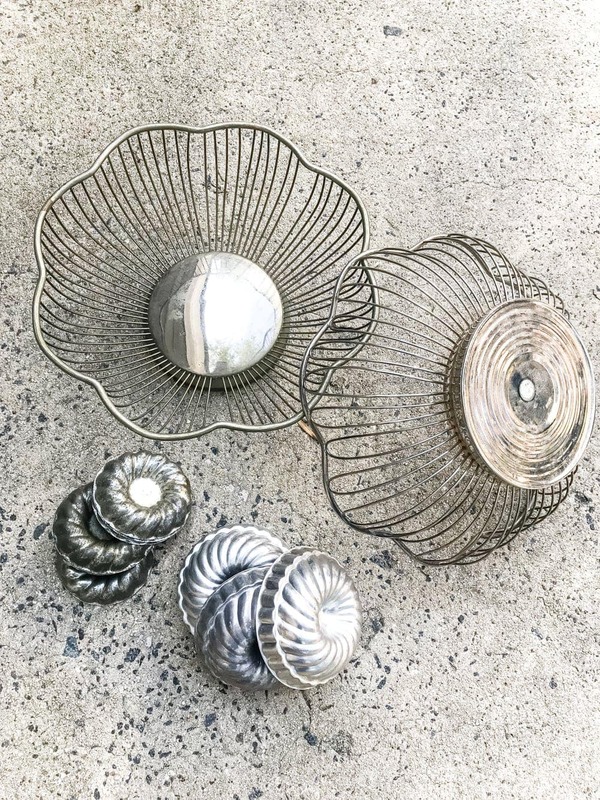 I’ll be walking along, moseying through the shelves of random junk, and get all kinds of ideas just by looking at how platters and lamps and candlesticks and toys and knick-knacks are all tossed haphazardly together. Maybe I just have a weird brain… who knows. Yeah, yeah that could be it. 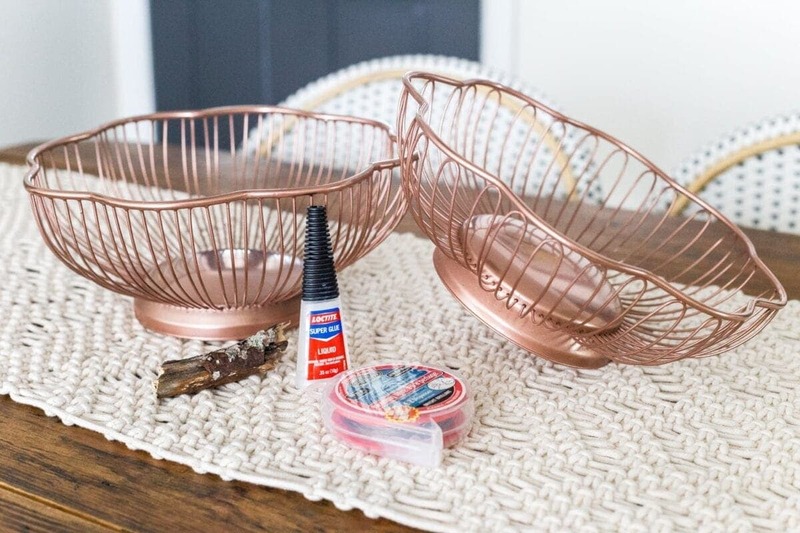 I see these wire baskets all the time in thrift stores and at yard sales and never thought twice about them until now. 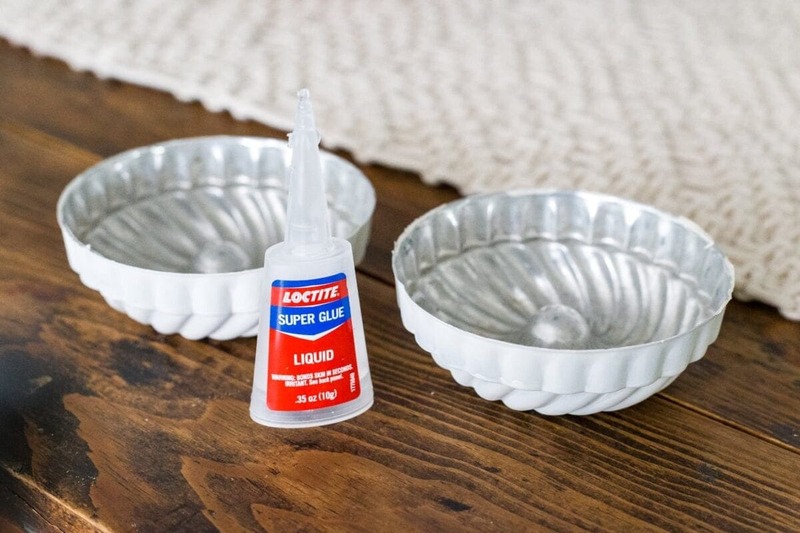 So I scooped up those cute little baskets off the shelf and skipped to the register along with an arm full of mini bundt pan / Jello molds because inspiration is just funny like that. 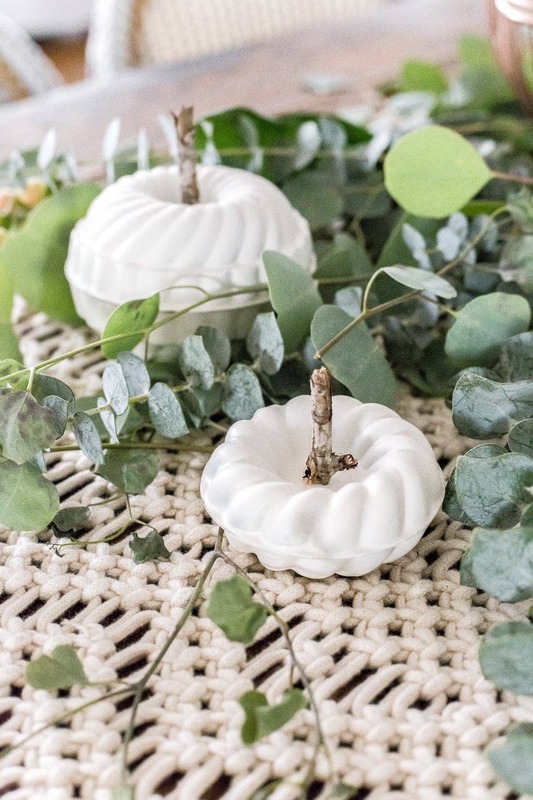 And I’m sharing it as a sweet thrifty pumpkin centerpiece craft for The Happy Housie‘s Seasonal Simplicity Series in today’s Fall DIY/Craft hop. 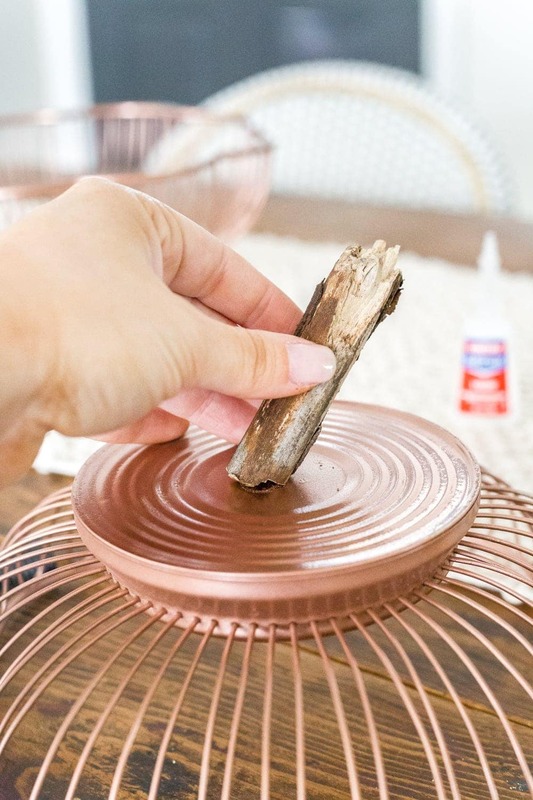 You can check out 25 more fall crafts and DIY project ideas at the bottom of this post. 1. 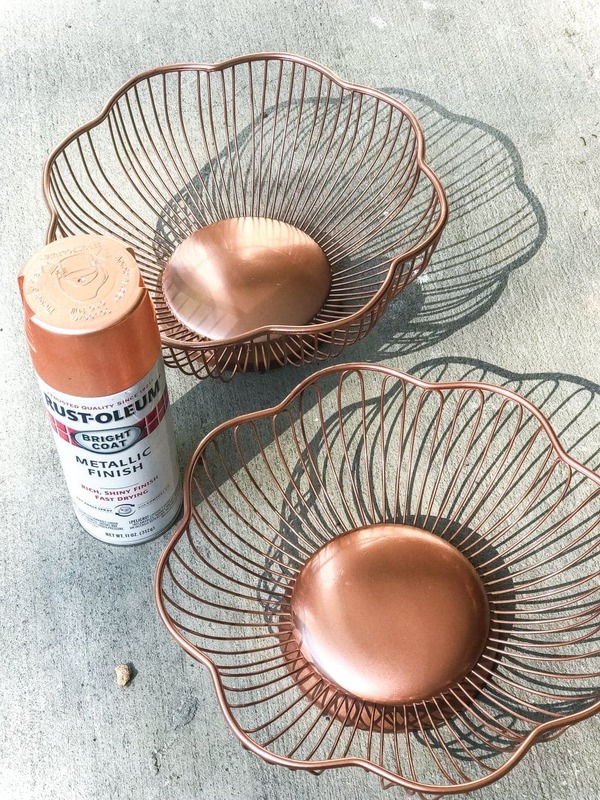 I love the look of copper for fall, so I decided to spray paint my wire baskets with the copper spray paint (but you could certainly leave them silver, if you wanted to keep some vintage patina). 2. 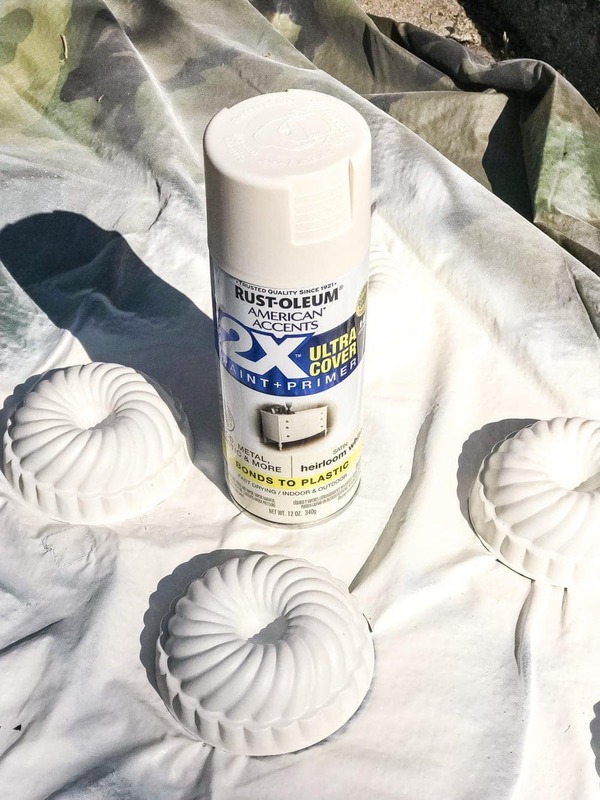 And for the mini bundt pan / Jello molds, I gave them a couple of coats of the white spray paint just because I’m a sucker for white mini pumpkins. 3. Once they were dry, I secured the two wire baskets together (one upside-down) with some wire. 4. And I applied a nickel sized dot of super glue to attach a stem to the top using just a piece of a stick I found in our yard. 5. 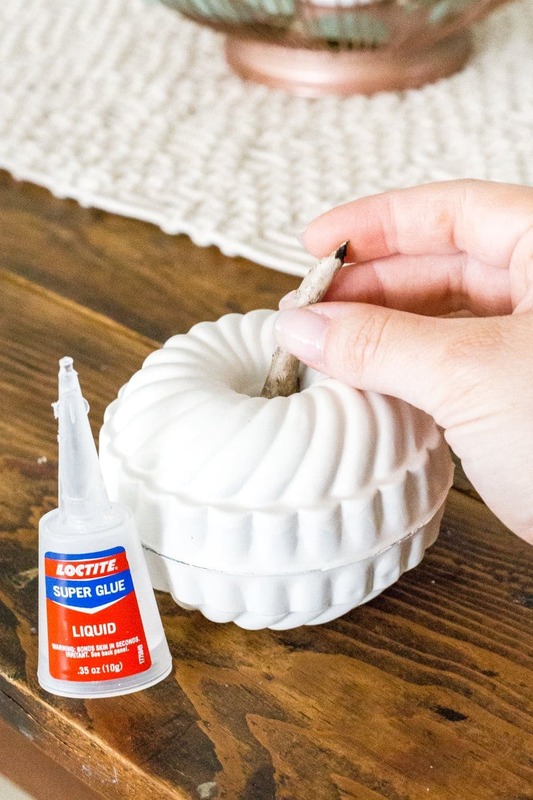 To make the mini pumpkins, I applied a little super glue around the edge of one of the bundt pans and placed another on top to attach them together. 6. Then, I just attached a little twig on top with a dab more of the super glue. So easy! Aren’t they cuuuuuuute?! I stuck a candle in the middle of the wire pumpkin to make it into a lantern, but you could fill anything in it really. 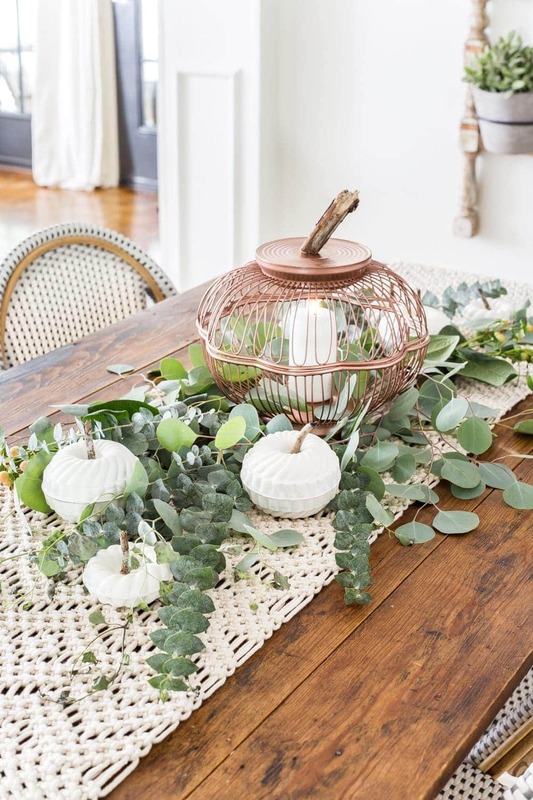 So now it’s a fun, whimsical fall centerpiece on our breakfast nook table. If you want to know about any of the sources in our breakfast nook, by the way, you can find them all here. 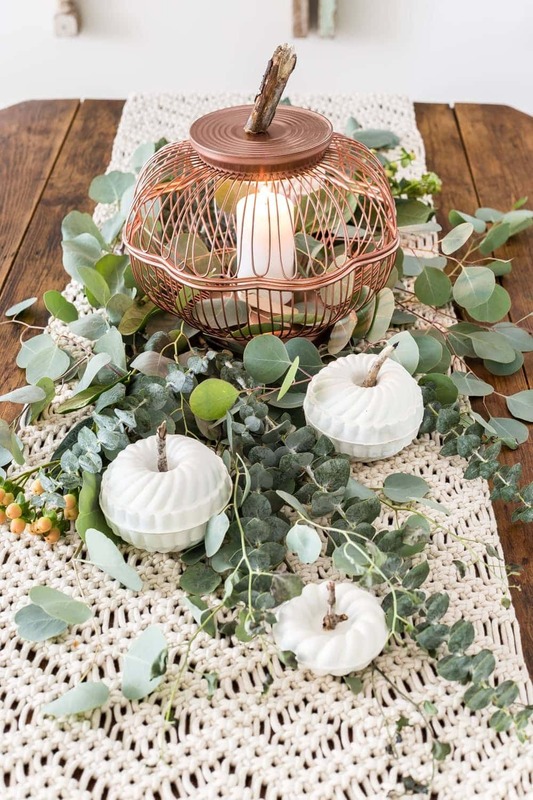 The greenery is just a couple of eucalyptus bundles I picked up at Trader Joe’s for $3 each. I’m obsessed! It’s my favorite any time of year but especially for early fall. 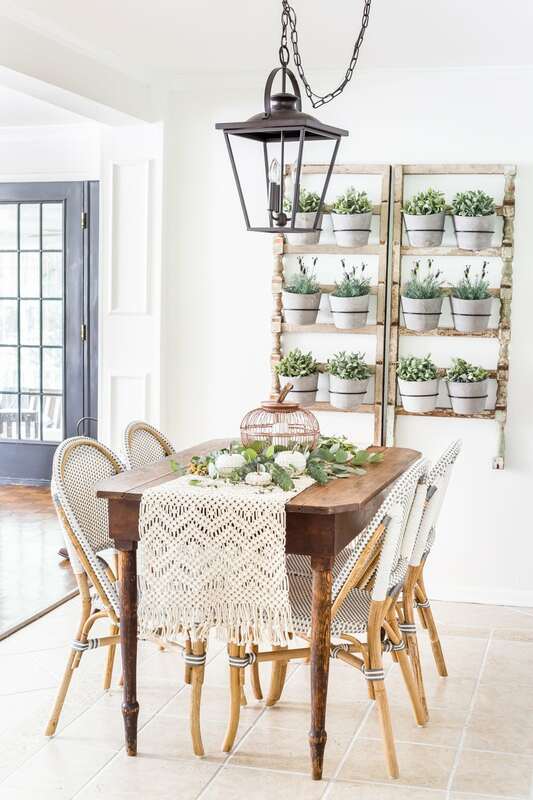 Love seeing items repurposed in stylish ways Lauren… very creative. What a clever and beautiful idea, Lauren! They look stunning and are the perfect fall touch! These are so cute! 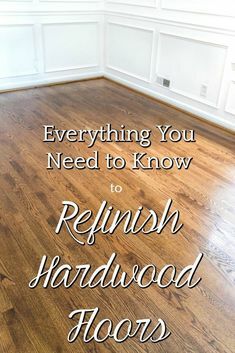 I love how this project turned out! Super creative! And they are perfect. Thank you for sharing! Oh wow absolutely adorable!! You have no idea how many of those large pumpkin bowls I have passed over at thrift stores and yard sales. I’m just sick about it now…lol! I also know that the closest goodwill has a few on hand and I will be heading there today! Love the jello mold pumpkins as well. I actually do buy those and have a good supply on hand. I can’t believe I didn’t think about doing this…I could kick myself…lol. Laura! What a unique and brilliant project this is! I love it! This is so creative and so beautiful!!! does your talent know no end!? Completely darling…well,just like you! 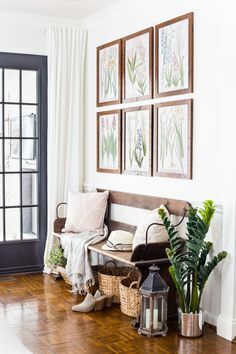 Super cute and inventive Lauren…pinning. I have some of those around so may have to do this! I have to admit I was skeptical when I saw the preview in my email. Everyone is trying to make pumpkins out of things nowadays and some are just ugly. But WOW! I love these! Now I have to go thrift shopping this weekend- Labor Day everything is half off. Thank you for such a cute idea! SO creative! 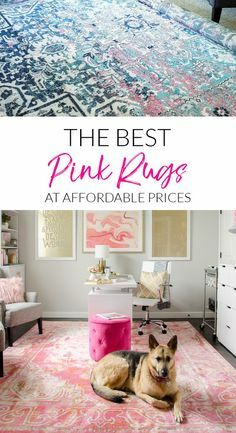 I love these so much and the whole vignette is beautiful! Beautiful! 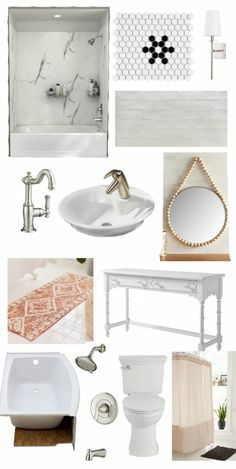 I love the white with the metallics and the greenery mixed in! These are just too cute! Thanks for sharing . . . 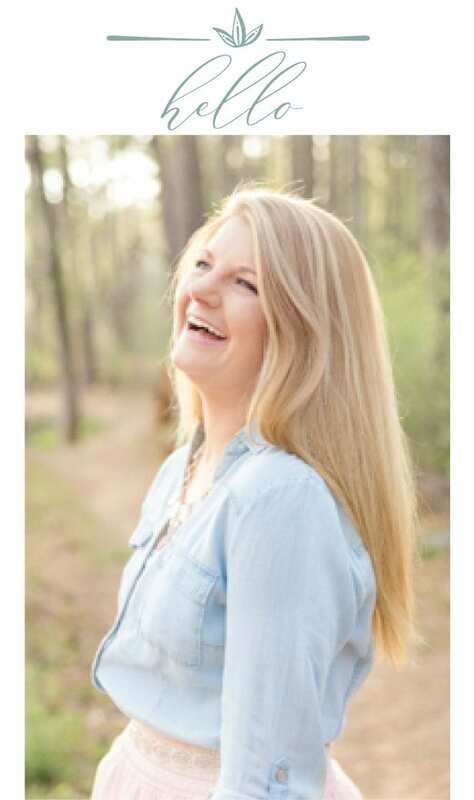 This is so unique and beautiful, Laura! 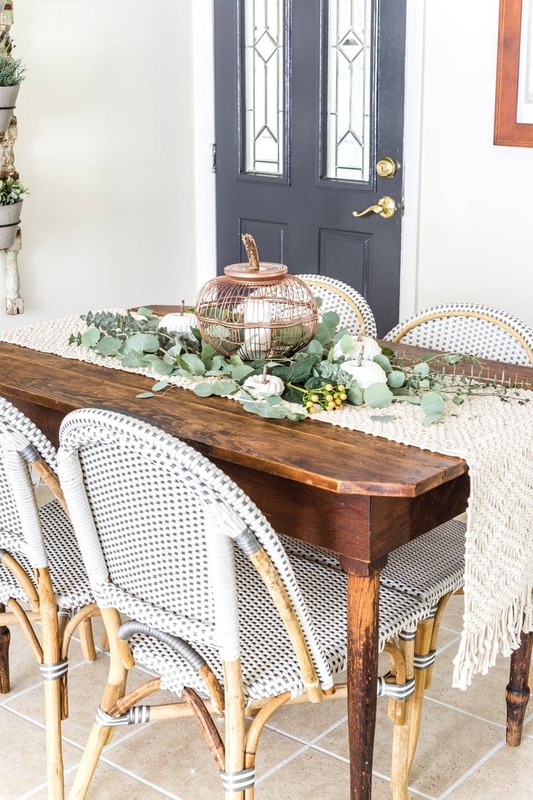 and have I told you that I’m in love with your dining area! So fun! 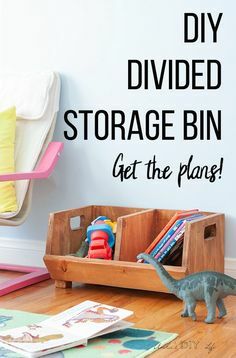 I love up cycling and this is just the best!! I love this idea. I never would have thought of this. Love this- you have the best ideas!!! Unbelievable! 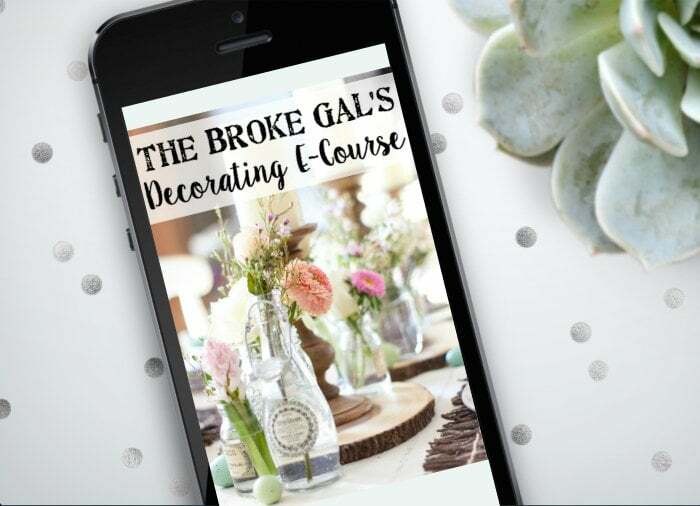 Your creativity astounds me…these are so gorgeous, Lauren!! If you added Spanish “moss,” which is more like dried string – not true moss – to the bundt pans sunken portion I think they’d look even better – though they are quite awesome as is, too. Is there anything you can not take from ugly, and turn it into totally fabulous? What a brilliant idea. I adore it! You are so creative, Lauren! I love the whole — think outside the basket — idea! Brilliant! Super cute and so clever, Lauren! Brilliant ideas! They look so charming and fun.